Small changes matter. That is true of many things in life, even when it comes to taking action to maintain heart health. Applying small changes at an early age can have positive, lasting effects. And making those changes before developing a chronic condition, such as high blood pressure or high cholesterol, is key. Why is this so important? Because heart disease is the No. 1 cause of death in the U.S. And most Americans aren’t even aware that they could be at risk for the disease. The American Heart Association suggests that you can take steps toward better heart health. You could lower your risk of heart disease and improve your quality of life by focusing on seven key health factors and behaviors. The great thing is that anyone can make these changes. 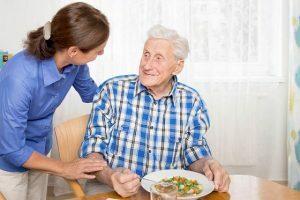 So, if you are concerned about the heart health of a loved one, or if you’re a family caregiver who needs to attend to your own health and well-being, pay attention to these seven improvements that could help you live a long, productive, healthy life. High blood pressure is a major risk factor for heart disease and stroke. When your blood pressure stays within healthy ranges, you reduce the strain on your heart, arteries and kidneys, which can ensure you stay healthier longer. Get the facts and learn how to manage your blood pressure. High cholesterol can cause plaque, which can clog arteries and lead to heart disease and stroke. Managing your cholesterol helps keep your arteries clear of blockages. If you have high cholesterol, work with your healthcare provider on the best treatment for you, which may start with – you guessed it – making important lifestyle changes like many of the ones listed here. Most of the food we eat is turned into glucose, also known as blood sugar. Our bodies use glucose for energy. Over time, high levels of blood sugar can damage your heart, kidneys, eyes and nerves. You can lower your risk of diabetes by maintaining a healthy weight, eating right and staying active. Find out if you’re at risk for type 2 diabetes, heart disease and stroke. A little activity can go a long way. Getting some form of physical exercise every day can help increase your length and quality of life. You don’t have to join a gym to get exercise. There are plenty of ways to stay active at home. Walking is a great place to start. Maintaining a healthy diet is one of the best ways to combat cardiovascular disease. You know the drill – eat more fruits and vegetables and watch the amount of salt and sugar you take in as these can increase your risk of obesity, high blood pressure and diabetes. Don’t forget about how you hydrate. Sugary beverages can be dangerous. Water is always your best choice. If you’re carrying extra weight, you could be damaging your heart, lungs, blood vessels and skeleton. Losing weight is a simple equation of calories in vs. calories out. In addition to shedding pounds, eating better and getting regular exercise also helps to lower your blood pressure, give you more energy and help you feel better overall! Smoking is the most preventable cause of premature death in the United States. Cigarette smokers have a higher risk of developing heart disease and stroke, and they have more than twice the risk of having a heart attack as nonsmokers. If you smoke, quitting is the best thing you can do for your health, so plan to kick the habit today. For more advice and information like this, subscribe to our weekly Home Care News, delivered straight to your inbox.